If we look at how much we’re using every day just at home, the average Canadian uses about 329L of water, the average Quebecer uses 400L of water per person, and, according to the Ville de Montréal, the average Montrealer uses 225 L of water per person. An actual number is very difficult to pin down because, unlike other large Canadian cities, much of Montreal does not meter residential water. Some boroughs and demerged towns do meter water, however many areas do not. Out of 29 OECD countries, Canada was the second largest consumer of water per capita in the year 2000. Montreal has to treat much more drinking water than needed because of leaks and pipe breaks. Our water treatment facilities produce 1104 L of water per person every day, more than double the per capita production in Toronto and Vancouver. This volume includes residential, commercial, industrial, institutional and municipal use, as well as the 20-40% of our potable water being lost due to leaks and about 500 pipe breaks per year. That’s a lot of fresh water that we’re not using and that is just being wasted. We’re also paying to treat all of that lost water, to a tune of $6 million per year in electrical bills for the Charles J. Des Baillets drinking water treatment facility in Lasalle alone. The City is currently undertaking many projects to repair and update our aging infrastructure to try and reduce the amount of water we’re processing at our drinking water treatment plants. Unfortunately, sometimes the repairs don't come soon enough. On January 29, 2013, an estimated 40,000 cubic metres of treated drinking water — that's 40,000,000 liters, or enough to fill 17 Olympic-sized pools — swamped parts of the downtown campus, causing damage to at least 12 buildings. The cause? An 88-year-old water main with a diameter of 120 cm that transferred water from the McTavish Reservoir to the Vincent d'Indy reservoir broke. The City of Montreal is currently investigating the cause of this break, which happened soon after a construction crew excavated the area near the pipe. 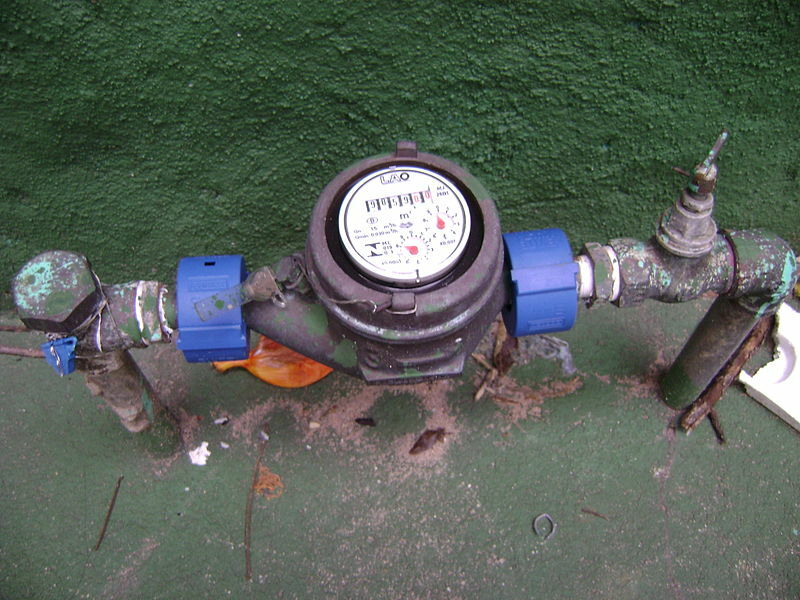 In 2002, the City of Montreal mandated that commercial establishments, industry, and institutions will be required to have water meters installed to measure the amount of water they are using. However, this project is currently on hold while irregularities in the contracting process are being investigated. In comparison, Toronto has a program in place to install automated water meters in every home over the next six years. This program allows residents to pay only for the water they actually use. In Vancouver, commercial, industrial, and institutional customers are billed according to the water they consume. For residential customers, all homes on property over half an acre in size have water meters installed, while smaller properties pay a flat rate for water usage. There are currently no plans in Montreal to install water meters in every home. Photo: Andrevruas. Wikipedia.org. Creative Commons Attribution 3.0 Unported license.